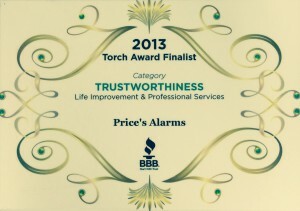 Price’s Alarms was nominated for a BBB Vancouver Island Torch Award! Over 104 individual companies were nominated for a Torch Award by local consumers and businesses for their commitment to trust, ethics and customer service excellence,” said Rosalind Scott, President & CEO of BBB serving Vancouver Island. “The judges have carefully reviewed the nominations, and 50 businesses are in the running to win a 2013 Torch Award for their demonstration of ethical business practices in the marketplace. Award Ceremonies were held in Victoria On Friday November 8th, 2013 and while Price’s Alarms was not chosen as the winner, we are very proud to have been selected as a finalist.